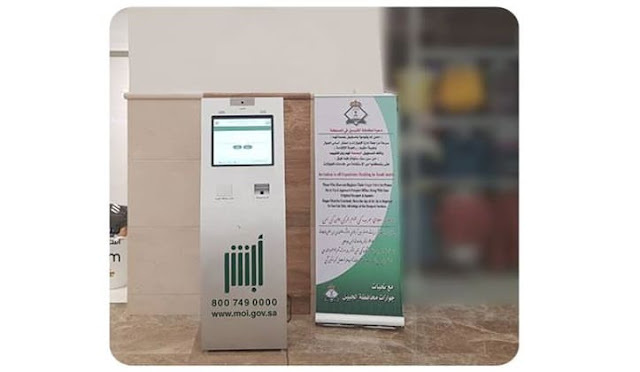 Register for MOI Absher Account using Self Service Kiosk Machine : Activate or Register for MOI Absher eservices account using self service Kiosk machine. If you are unable to register MOI Absher account through Ministry Of Interior website due to any reason then you can proceed with this very simple and easy method which will be completed in few minutes of time. 1. Go to nearest Absher Kiosk Machine, Choose your language Arabic or English. 2. Enter your Iqama number (Resident ID) or National ID. 3. Place index finger of your right hand on finger print reader. 4. Place index finger of your left hand on finger print reader. 5. Enter your personal mobile number (should be available with you to receive SMS code). 6. Enter SMS code you received. Now your MOI Absher account is registered and activated, you are ready to use eservices provided by Ministry Of Interior. Locations of Absher Self Service Kiosk Machine for Registration and Activation : Reach the below mentioned offices for absher account registration and activation purpose in between the time. Dawadmi Passport Office, Afif Passport, Wadi-el-Dawaser Passport, Shaqraa Passport, Zulfi Passport, Aflaj Passport, Hutat bani Tamim Passport, Huraimlaa Passport , Muzahmiya Passport, Majma'a Passport, Sajer Passport, Hutat Sedair Passport, Artawiyah Passport, Al Ghat Passport, Thadeq Passport, Jamash Passport, Rowaidah Passport, Rumah Passport, Makkah Passport, Jeddah Passport, Investment General Authority Passport, Saudi Airlines Passport, Tayef Passport, Rabigh Passport, Qunfudah Passport, Khurma Passport, Ranya Passport, Turba Passport, Al Madinah Passport, Investment General Authority Passport, Al Ula Passport, Al Mahd Passport, Yanbu Passport, Dammam Passport, Khubar Passport, Al Ahsa Passport, Al Jubail Passport, Dahran Aramco Passport, Hafr-el-Batin Passport. King Khalid City Passport, Rass Tanoura Passport, Al Khafji Passport, Al Naeriyah Passport, Qariat al Ulaya Passport, Buraidah Passport, Onaizah Passport, Al Rass Passport, Al Bekairiyah Passport, Oyon Al Jawa Passport, Al Mathnab Passport, Al Shannanah Passport, Aseer Passport, Abha Passport, Khamis Mushayt Passport, AL Nammas Passport, Basha Passport, Mahayel Aseer Passport, Surat Abeedah Passport, Tathleeth Passport, Dahran Al Janoub Passport, Aseer- Balgran Passport, Al Baha Passport, Bagurashi Passport, Al Mandeg Passport, Al Makhuat Passport, Galawah Passport, Hayel Passport, Baga'a Passport, Al Ghazal Passport, Al Jouf Passport, Al Qurayyat Passport, Domat-el Jandal Passport, Tabarjal Passport, Tabouk Passport, AL Wajh Passport, Debaa Passport, Ar'Ar Passport, Rafha Passport, Tareef Passport, Jazan Passport, Farasan Passport, Najran Passport, Sharorah Passport, Habuna Passport. do police keep anonymous fingerprints?